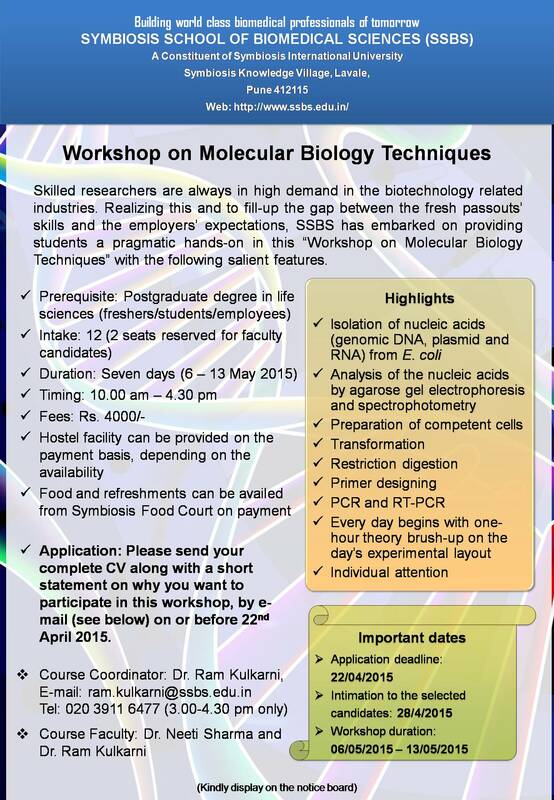 Biotech sales vacancies @ BioResource Biotech, Pune. At HiMedia, we are constantly on the lookout for top talent. Enthusiastic individuals are always welcome to join our team to propagate the values of excellence in the service of humankind. If in case, opportunities shown below does not reflect your specific talent, still please do not hesitate to drop us a line with your resume in full confidence and your resume is welcome. There can be a chance that we shall be pleased to have a personal chat with you. A 2-year Master’s degree programme (Degree to be awarded by the University of Mysore) in Human Disease Genetics is due to begin at the Centre for Human Genetics, Bangalore. This will be a unique interdisciplinary program at the interface of modern biology and medicine. It will cover fundamental biology, human genetics and genomics, clinical genetics, genetic counselling, population biology and statistics. The course will consist of lectures, laboratory work, seminars and discussions. There will be a strong component of research, case studies and activity-based learning. The programme can be viewed as a first step towards a professional career in human genetics, disease diagnostics and allied biomedical fields, or advanced studies leading to a Ph.D. or MD (for those with a medical degree). A Bachelor’s degree in any area of biology or medicine. Motivated candidates with an undergraduate degree from other streams can also apply.